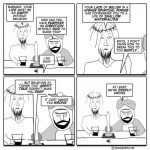 So why doesn’t Moses drink? Or is that a saki shot glass in front of him????? Barperson? Barista? Tapperson? Tappist? I don’t know, none of them seem very good. Maybe we should ask the lady herself. I’m assuming that’s a shotglass in front of Moses, not necessarily saki that is (was) in it. Mo originally called her “serving wench”, so his manners have definitely improved. As for Moses, I’ve never seen the Guardianista mindset more succinctly depicted. @ Author- mistake in last panel. Should be “call” instead of “called”, unless I am even tireder than I thought. 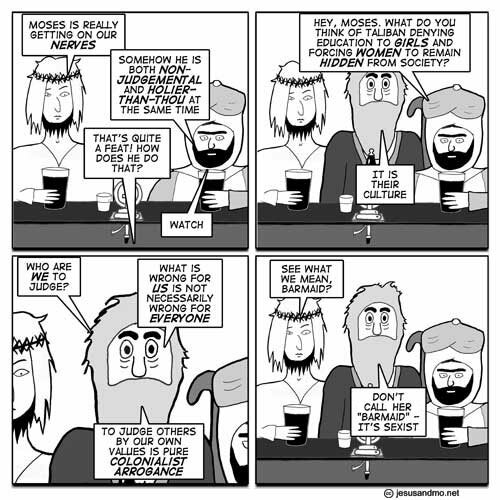 Totally makes sense that Moses would be drinking straight up. He wouldn’t want mixes to pollute his alcohol. He’s consistent in his views: non-sexist, non-discriminatory, totally po-mo. hey moses whatcha think bout little girls MURDERED by the taliban for going to school? Is it ok cause it’s their culture? Moses would never drink anything with water (or ice cubes) in it. Just ask Jesus, some people walk on that stuff. 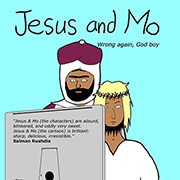 @nina : I think Moses assumes Jesus and Mo share his values & culture. Since (as far as he’s concerned) they’ve had the same upbringing he feels it’s Ok to lecture them on their failings.